Records for both rough and faceted diamonds. 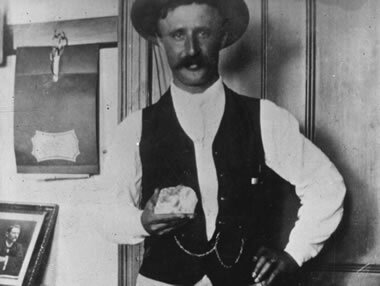 The Cullinan Diamond: A photograph of the Cullinan Diamond being held by Frederick Wells, who discovered it while working as the surface manager of the Premier Mine. This photo was taken in 1905 by an unknown photographer. The diamond was quickly dubbed the “Cullinan Diamond” by the press. That name referred to Thomas Cullinan, who was founder and chairman of the Premier Mine. 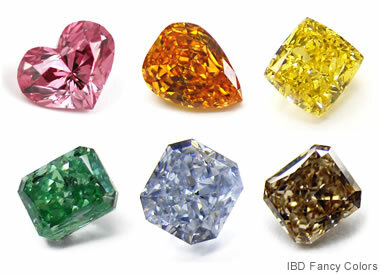 Colored Diamonds: Diamonds can occur in a variety of beautiful colors. Learn how these colors are produced by tiny defects in the diamond crystal by visiting our article about fancy colored diamonds. Images above are used with permission of IBD Fancy Colors LLC. Thomas Cullinan made a name for himself by discovering the Premier diamond field in 1898 after tracing diamond-bearing alluvial deposits upgradient to their source. He opened the Premier Mine in 1902, making him the first person to break De Beers’ overwhelming control of hard rock diamonds mined in Africa. Premier Mine Now Named "Cullinan"
The Premier Mine was renamed the Cullinan Mine in 2003, shortly after its 100th anniversary. It is now owned and operated by Petra Diamonds. The mine is a prolific producer of large diamonds. It has produced nearly 800 diamonds weighing over 100 carats. It is also the world's only important source of blue diamonds. 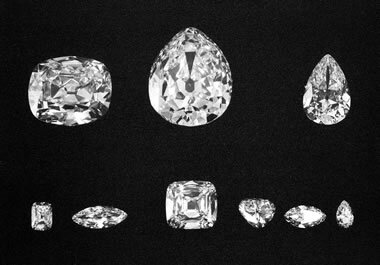 The Nine Main Cullinan Diamonds: This photograph shows the nine major stones cut from the Cullinan rough diamond. Together these nine stones weigh a total of 1055.89 carats. They have been named using Roman numerals as Cullinan I through IX. In the photograph above they appear, starting at top left and progressing clockwise, Cullinans II, I, III, IX, VII, V, IV, VI, VIII. This photograph was taken in 1908 by an unknown photographer. King Edward VII decided to have the diamond cut into faceted gems. In January of 1908 he gave that job to Asscher Brothers Diamond Company, a family-owned business of gemcutters located in Amsterdam. Their family was considered to be the most accomplished diamond cutters in Europe at that time. The two largest stones, the Cullinan I and Cullinan II, were sent back to the King. The rest of the cut stones and fragments remained with Asscher Brothers as their manufacturing fee. This may sound like an excessive manufacturing fee; however, each of the two largest stones had an individual value that greatly exceeded the value of all the rest combined. At 530.2 carats, the Cullinan I was now the largest faceted diamond in existence, and it was of exceptional color and clarity. 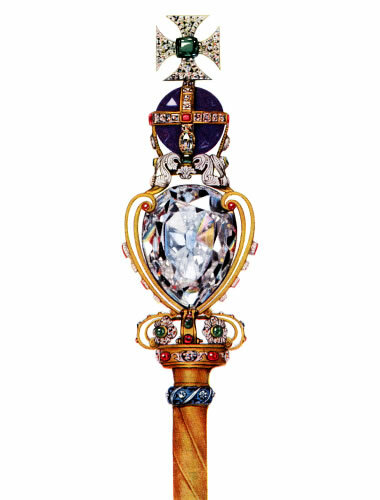 The Sovereign’s Sceptre with Cross: This sceptre is a part of the Crown Jewels of the United Kingdom. It is a symbolic ornament that is held by the monarch at important events, such as a coronation or a significant anniversary. The Cullinan I diamond serves as the head of the sceptre. This illustration was created by Cyril Davenport in 1919. In 1910, after King Edward VII’s death, King George V decided that the Cullinan I and the Cullinan II should become part of the Crown Jewels of the United Kingdom. 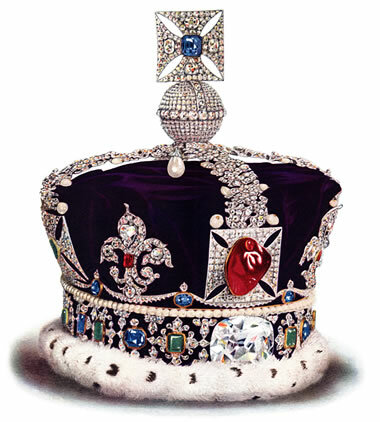 He ordered the Cullinan I, a 530.2-carat pendeloque-cut brilliant, be set in the head of the Sovereign’s Sceptre (shown in the accompanying illustration). The Cullinan II, a cushion-cut brilliant oval of 317.4 carats, was set in the front forehead position of the Imperial State Crown, immediately below the Black Prince's Ruby (which is really a red spinel). To give that position to the Cullinan II, the original gem in that position, the spectacular Stuart Sapphire, a 104-carat oval, was moved to to the back of the crown. The Cullinan I and Cullinan II are also known as the “Great Star of Africa” and the “Second Star of Africa”, respectively. The Imperial State Crown: This crown is a part of the Crown Jewels of the United Kingdom. It is worn by the monarch after a coronation and at other formal events such as the annual State Opening of Parliament. This illustration was created by Cyril Davenport in 1919. It shows the Cullinan II diamond in the front forehead position, below the Black Prince’s Ruby. At the time of its cutting, the Cullinan I diamond was the largest faceted diamond in existence. Since then, only one larger faceted diamond has exceeded it in carat weight. That is the 545.67-carat Golden Jubilee Diamond, a brown diamond, which was faceted into a fire rose cushion cut from a 755.5-carat piece of rough. The rough used to cut the Golden Jubilee was found at the Premier Mine in 1986, while the mine was owned by De Beers. The diamond was exhibited at numerous locations by De Beers to showcase the largest faceted diamond in the world. In 1995, it was purchased by a group of Thai businessmen, who also exhibited the diamond at many locations. In 1996 it was given to King Bhumibol Adulyadej of Thailand as a gift from the people on the 50th anniversary of his coronation. This is when it received its “Golden Jubilee” name. It remains today as part of the Crown Jewels of Thailand. The Cullinan Diamond, article on the Royal Collection Trust website, accessed January 2019. Diamond Sources and Their Discovery, by Alfred A. Levinson; Chapter 4, in, The Nature of Diamonds, edited by George E. Harlow; published by Cambridge University Press, pages 72 to 104, 1998. The Nine Stones Produced from the Cullinan Diamond, an article on the Royal Collection Trust website, accessed January 2019. The Book of Diamonds, by Jooan Y. Dickinson; Published by Dover Publications; 256 pages, 2001. Famous Diamonds, fifth edition, by Ian Balfour; published by Antique Collectors Club, 336 pages, 2008. The Larousse Encyclopedia of Precious Gems, by Pierre Bariand and Jean-Paul Porot; published by Van Nostrand Reinhold, 256 pages, 1991. The Cullinan Diamond Centennial: A History and Gemological Analysis of Cullinans I and II, by Kenneth Scarratt and Russell Shor; Gems & Gemology, Volume 42, Number 2, pages 120 to 132, Summer 2006. Golden Jubilee, an article that once appeared on the De Beers Group website but has been hosted on the Internet Archive since June 13, 2008. The Nature of Color in Diamonds, by Emmanuel Fritsch; Chapter 2, in, The Nature of Diamonds, edited by George E. Harlow; published by Cambridge University Press, pages 23 to 47, 1998. Sergio (carbonado), an article on the Wikipedia website, accessed January 2019. Carbonado Diamond: A Review of Properties and Origin, by Stephen E. Haggerty; Gems & Gemology, Volume 53, Number 2, pages 168 to 179, Summer 2017. Carbonado diamonds are masses of microcrystalline diamonds arranged in a variety of crystallographic orientations. They are usually opaque, gray to black in color, and may exhibit obvious pore spaces. Carbonados are a variety of industrial diamonds, not suitable for manufacturing faceted gems. Most of them have been crushed for use as abrasive granules. The largest carbonado diamond ever found was named “Sergio”, after its finder Sérgio Borges de Carvalho. He found the carbonado diamond in 1893 in surface sediments near Lençóis, a community in the state of Bahia in Brazil. It was slightly larger than the Cullinan at 3,167 carats.